On 10 February 2018, we celebrate the centenary of the repudiation of illegitimate debts by the soviets on 10 February 1918. Translated for CADTM by Christine Pagnoulle with Vicki Briault. 2018 is thus the centenary of several achievements of the Russian revolution. One of them, which is often ignored, is the fulfillment of a promise made by the Russian revolutionaries in 1905: by a decree published in the official journal on 10 February 1918,2 all debts contracted by the Tsarist regime that had been overthrown some eleven months earlier were cancelled. The same applied to debts contracted by the provisional government between the fall of the Tsar and the October 1917 revolution, as they further mobilized public money for the purpose of waging war, thus perpetuating a situation of violence and hardship while the people demanded peace. 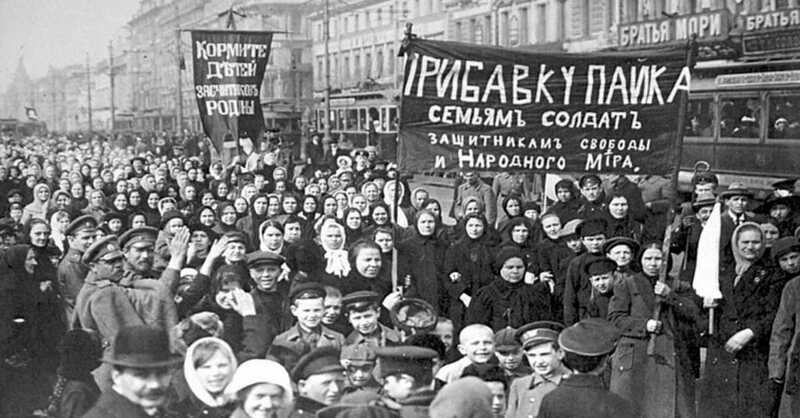 Demonstration by women in Petrograd on 1917, February 23. 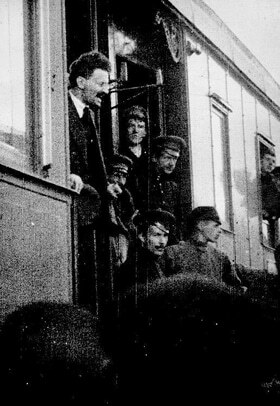 Leon Trotsky arriving in Petrograd on May, 1917. In December 1905, the St-Petersburg soviet3 published a call known as the ‘Financial Manifesto’,4 in which they exposed the illegitimacy of debts contracted by the Tsar and announced that they would not be acknowledged once the autocratic regime would be overthrown. The government is on the brink of bankruptcy. It has reduced the country to ruins and scattered it with corpses. The peasants, worn out by suffering and hunger, are incapable of paying taxes. The government gave credits to the landowners out of the people’s money. Now it is at a loss as to what to do with the landowners’ mortgaged estates. Factories and plants are at a standstill. There is unemployment and a general stagnation of trade. The government has used the capital obtained by foreign loans to build railways, warships and fortresses and to store up arms…. For many years the government has spent all its state revenue on the army and navy. There is a shortage of schools. Roads have been neglected. In spite of this, there is not enough money even to keep the troops supplied with food…. The government has pilfered the savings banks, and handed out deposits to support private banks and industrial enterprises, often entirely fictitious ones. It is using the small saver’s capital to play the stock exchange, where that capital is exposed to risk daily. Between 1905 and 1917, the situation got worse. In 1914, the German, British and French imperialisms engaged in an incredible slaughter to expand their respective share of the world. Among the declining empires, Austria-Hungary and the Ottoman Empire sided with the German Empire while Russia sided with France and the British Empire, hoping among other expectations to gain direct access to the Mediterranean in Constantinople, the capital city of the Ottoman Empire.7 Among Russian socialists in exile, the future leaders of Soviet Russia opposed the war as soon as it started and called upon solidarity between all European peoples in their common struggle against their respective bourgeoisies. French daily newspaper L’Humanité on November, 1917. This file also demanded the establishment of a “Russian Debt Commission” aiming at setting up a foreign financial monitoring on Russia and compelling it to repay debts it had repudiated. The Conference of Genova in 1922. The French Convention, from which modern France claims direct descent, proclaimed, on September 22nd, 1792, that “the sovereignty of peoples is not bound by the treaties of tyrants.” In conformity with this declaration, revolutionary France not only destroyed the political treaties entered into with foreign countries under the old regime, but also repudiated her National Debt. She only consented to pay one-third of it, and that for motives of political expediency…. This procedure, exalted into a doctrine by eminent legal experts, has been almost universally followed by Governments created by revolutions or by wars of liberation. The United States repudiated the treaties of their predecessors, England and Spain. in Western Europe…, if you lend money to a man and he promises to repay you, you expect that he will repay you. [Another prejudice] is this: you go to a man who has already lent you money, and say, ‘Will you lend me more?’ He says to you, ‘Do you propose to repay me what I gave you?’ And you say, ‘No, it is a matter of principle with me not to repay.’ There is a most extraordinary prejudice in the Western mind against lending any more money in that way. And if you are writing a letter asking for more credits, I can give one word of advice to anybody who does that. Let him not, in that letter, enter into an eloquent exposition of the doctrine of repudiation of debts. It does not help you to get credits. It may be sound, very sound, but it is not diplomatic. 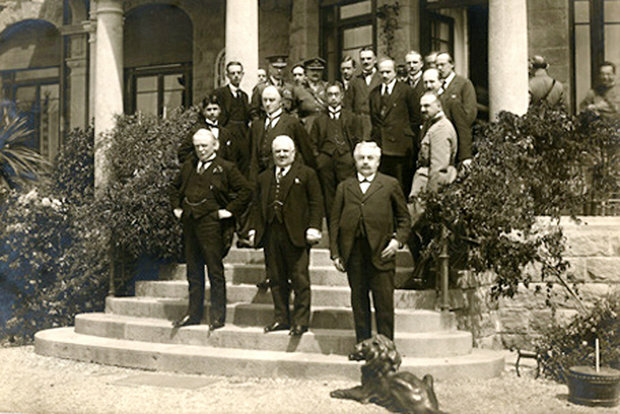 The conference ended without any agreement being found between Soviet Russia and its European creditors. A bilateral agreement had however been concluded with the Weimar Republic (that had replaced the German Empire after its defeat),11 with each party forfeiting war compensations. Besides, whereas it might have been anticipated that the firmness showed by the Soviet government and the failure of the Genoa conference would result in the capitalist powers adopting a more intransigent position toward Moscow, the opposite occurred. 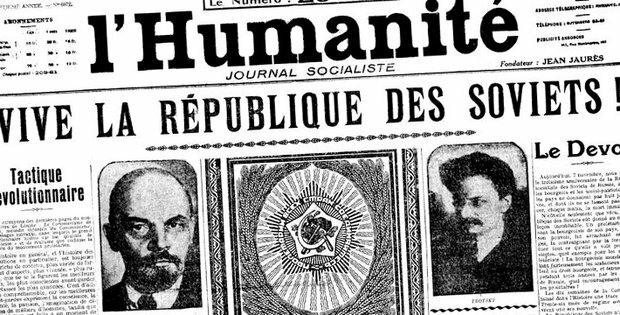 ↩ Éric Toussaint, “Lenin and Trotsky confronting the bureaucracy – Russian revolution and transitional societies”, Europe solidaire sans frontières. ↩ The decree was adopted on 3 February 1918 and published in the official journal one week later. These dates are expressed according to the current Gregorian calendar. At the time and for a few more days, Russia was still using the old Julian calendar. According to this former calendar, the decree of repudiation was adopted on 21 January and published in the official journal on 28 January. ↩ The soviets (Russian word for ‘councils’) first appeared during the revolutionary movement of 1905 and spread to all areas and activities in 1917. They are bodies through which the revolutionary movement self-organized. The soviet in St-Petersburg, the capital city of Russia until March 1918, played a decisive part in leading the 1905 and 1917 revolutions. ↩ The text of the manifesto was reproduced by Leon Trotsky, president of the St-Petersburg soviet, in 1905, chapter 20. The passages from the manifesto that are quoted in this article refer to this version. The work is available online. ↩ According to the odious debt doctrine, a debt is said to be odious and can be cancelled if it was contracted against the interest of the population and if creditors are or could be aware of this. The fact that creditors knew they were helping a despotic regime is an aggravating factor but is not a sine qua non condition to determine the odious nature of a debt. See Éric Toussaint, “Demystifying Alexander Nahum Sack and the doctrine of odious debt”, cadtm.org. ↩ Nathan Legrand, Éric Toussaint, “The French press in the pay of the Tsar”, cadtm.org. ↩ London and Paris had promised the Tsar that he would get Constantinople from the Ottoman Empire. France would retrieve Alsace and Lorraine from the German Empire as well as part of the Middle East (Lebanon and Syria) from the Ottoman Empire. The United Kingdom would comfort its colonies in the Middle East (Palestine, Jordan, Iraq, the Arabic peninsula) and in Persia. Finally, France and the United Kingdom planned to share the German colonies in Africa: Togo and half of Cameroon for France; Tanzania, the other half of Cameroon and Namibia for the UK. Belgium, that already owned the Congo, would get Rwanda and Burundi from the German Empire. This was all arranged without taking the least account of the right of peoples to self-determination. ↩ Leon Trotsky, My Life, 1930, chapter 14. The work is available online. ↩ In Germany as in other countries involved in the war, opposition to war had grown steadily as the war lasted. 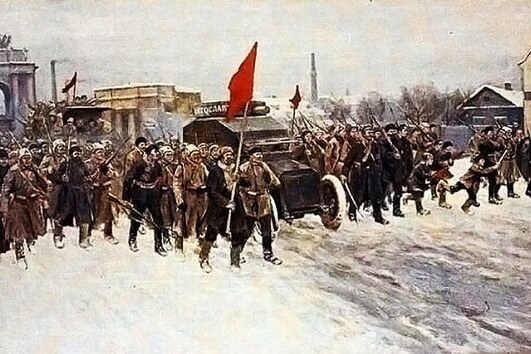 In January 1918, while the German empire was attempting to impose its diktat on Soviet Russia during the Brest-Litovsk peace negotiations, a general strike of German workers demanded peace without annexation. The strike movement was eventually defeated. End of October of the same year, German sailors mutineered in Kiel, a harbour city on the Baltic. Soldiers’ and workers’ councils were formed on the same pattern as the soviets in Russia, and seized power in several German cities (Kiel, Hamburg, Hanover, Frankfort, Munich, etc.). On 9 November, a mass demonstration took place in Berlin. Emperor Wilhelm II abdicated and social-democrat Friedrich Ebert became the first head of government of the Weimar Republic, which functioned as a parliamentary democracy. But power was also claimed by the soldiers’ and workers’ councils that wanted to set up a republic of councils on a soviet pattern. In January 1919, on order of Friedrich Ebert’s government, revolution was suppressed in blood by Freikorps, far-right militia that opened the way to Nazism in Germany. Rosa Luxemburg and Karl Liebknecht, who were at the head of the Communist Party, were murdered on 15 January 1919. Afterwards, with Friedrich Ebert as president, the Weimar Republic was run by an alliance between social-democrats, liberals and Christian conservatives, that was still in power at the time of the Genoa conference. Nathan Legrand is a part of CADTM Belgium.